Paris banned cars on some of its streets for a day and its quality of life improved significantly. 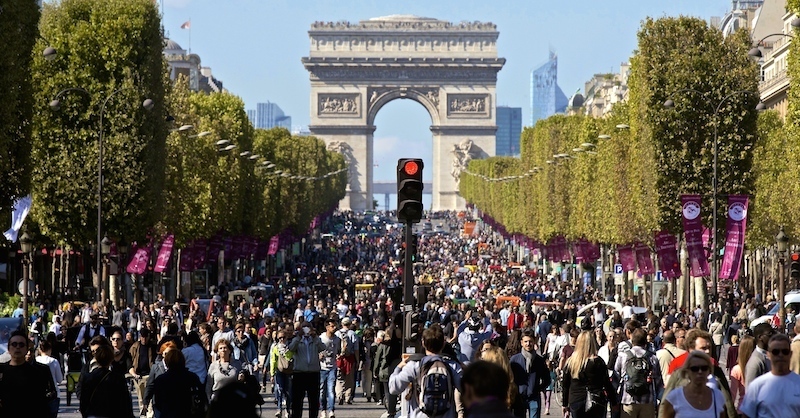 On September 27 the City of Light held its first “car-free day” (well sort of car-free day) as part of the worldwide car-free movement that began in the 1990s. Similar air quality improvements also occurred almost exactly a year earlier in Hong Kong when vehicle traffic was stopped in three small areas by the Umbrella Movement democracy demonstrations. The average air pollution measured by HK’s three roadside monitors is typically higher than the average measured by the other twelve monitors in the city’s system. But on September 29, the day after the Umbrella Movement began, the average of the roadside monitors fell below the average of the other monitors and stayed that way for almost three weeks until the scope of Umbrella road closures was significantly diminished. In 2005 deaths caused by traffic emissions were more than deaths caused by traffic accidents in the U.S. Thanks to Andy Nolan for posting the original link that inspired this article.